Environment Agency officers stopped and checked 60 vehicles carrying waste in an operation in the North East. They checked vehicles to ensure they had a valid licence to carry waste, that vehicles were properly maintained, waste was secured to prevent escape and was transferred with the correct paperwork. The operation focused on waste sites in Washington and took place last Wednesday, October 5. Officers also gathered information on waste vehicle movements, waste carriers, and measures to prevent litter escape. The DVSA also did vehicle checks and looked at site transport procedures, serving one prohibition notice. There’s a legal obligation on those who produce and manage waste to make sure it is handled responsibly and legally – this is called their ‘Duty of Care’. The deliberate mis-description of waste defrauds public funds, causes damage to the environment and impacts on legitimate businesses. We’re working hard to raise awareness and ensure waste carriers and the permitted sites which accept waste are following their duty of care responsibilities. This helps minimise the impact on communities and the environment that we all enjoy. While no vehicles were identified as breaching their duty of care during the operation, there will be follow up work with regards to vehicle maintenance, improvements to current waste security measures and duty of care paperwork. And officers carried out walkabouts in the local community to speak to residents about the operation and provide reassurance about work ongoing to minimise the impact of waste sites where they live. 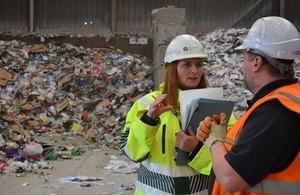 Throughout this month, the team will be visiting local businesses to talk to them about their responsibilities handling waste, carrying out vehicle observation days and working with partners and the community. The activity it part of the ‘right waste, right place’ national campaign, launched to help businesses understand what is expected of them. Run by the Environmental Services Association (ESA), the campaign is supported by the Environment Agency and Chartered Institution for Wastes Management (CIWM) and offers practical advice on how to manage waste safely and efficiently.